This study aims to validate the Material Values Scale for children (MVS-c) by Opree et al. (Personality and Individual Differences, 51(8), 963-968, 2011) among children in early childhood. The MVS-c was originally developed to assess materialism among children between the ages of eight to eleven, and consists of three subscales measuring material centrality, material happiness, and material success. We administered the MVS-c to a sample of 120 elementary school children between the ages of six to eight. The MVS-c was presented orally in a structured interview and with the aid of visual response options. We examined the factorial structure, reliability, and construct validity of the full-length 18-item scale as well as the shorter 6- and 3-item versions. Analyses using structural equation modeling showed that its factorial structure (i.e., with material centrality, material happiness and material success as first-order factors and overall material values as a second order factor) holds for younger children. Though the 3-item MVS-c cannot be used among six- to eight-year-olds, the 18-item MVS-c and the shorter 6-item version proved to be both reliable and valid in this age group. 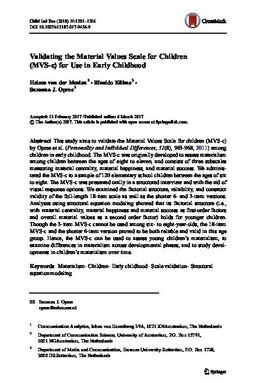 Hence, the MVS-c can be used to assess young children’s materialism, to examine differences in materialism across developmental phases, and to study developments in children’s materialism over time.